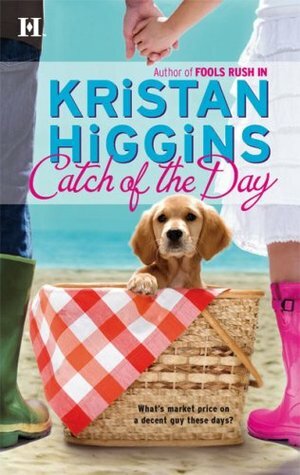 Catch of the Day is about Maggie Beaumont, who owns a diner in a small fishing village in New England called Gideon’s Cove and has a seriously poor track record with picking men. A true highlight was when she feel for the cute new Irishman only to find out that he was the new local priest. So that’s generally how Maggie’s life has been going. First date à la Maggie: Take one lovelorn diner owner (me), a generous helping of nosy local gossips, a dollop of envy at married sister’s perfect life, a splash of divine intervention (my matchmaking priest). Combine ingredients with one adorable puppy, add a strong but silent lobsterman with a hidden heart of gold and watch the sparks fly. Set in the trio of Gideon’s Cove novels, Catch of the Day, was so very fun. I loved Maggie and was cheering her on to find that happily ever after with Malone – who turns out to have quite the personality, you just have to break the frosty layer. Frothy and fun, with many laugh-right-out-loud moments, I’d recommend picking this one up for a read by the pool or on the beach, complete with a ice cold Diet Coke. Lobster Fishing: A video of what Malone’s professional life look like. Golden Retrievers: Catch of the Day’s star dog is Colonel, a loyal and lovely golden retriever. To learn more about the breed, click the link.